A robotic flame treating cell consists of a multi-axis robot (manufacturer of robot can be set to the specification of the customer) that has been equipped with a burner as the end of arm tooling, proper fixtures for the component(s), guarding and programming to control the system to perform various potential functions. The most common function is to have the robot contour the part with the flame to increase the surface tension of the part to enhance the adhesion of printing, painting or gluing another substrate to the surface. The secondary function could be to have the flame trace a specific path to “smooth” the surface such as a parting line of a mold. Sometimes titled “flame surface trimming”. 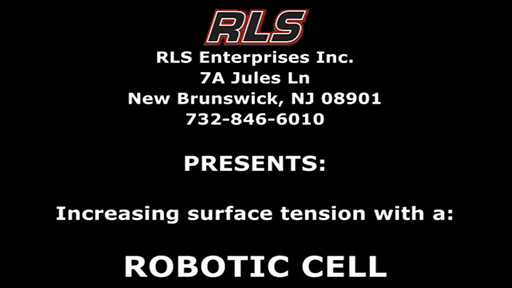 RLS specializes in designing the cell to meet the custom requirements of your project. Our full design and fabrication capabilities produce simple yet accurate tooling for ease of loading, quick change overs and accurate flame treating.